Here’s a heart-healthy salad…literally. It’s super simple to make these Valentine’s Day heart fruit kabobs and one that your kids will absolutely adore. Use heart cookie cutters to cut out heart shaped watermelon and cantaloupe. Add some color with grapes or other berries. Cut out a triangle-shaped piece of cantaloupe to make the arrowhead. Cut another triangle-like shape to make the fletching on the end. String the fruit shapes onto the bamboo skewer to make the arrow. 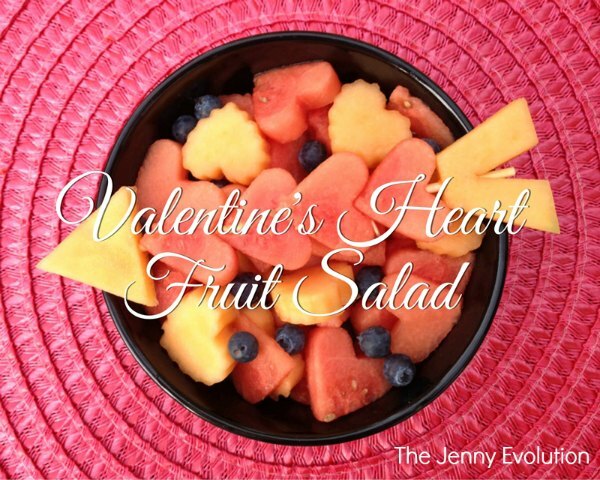 Enjoy more Valentine’s Day Inspiration on The Jenny Evolution! I am always on the lookout for healthy recipe ideas for kids during the holidays. This is perfect and simple to make idea. We will have to give it a try.